Illuminations: Reflections of Earth is the nightly fireworks show in Epcot across World Showcase Lagoon. A great accent to the ideals behind Spaceship Earth, this show celebrates Earth's story- the story of us. I don't have great pictures to share but if you head over to the Disney World official site they have great information about how it works, where and when to grab a seat, and daily times information! 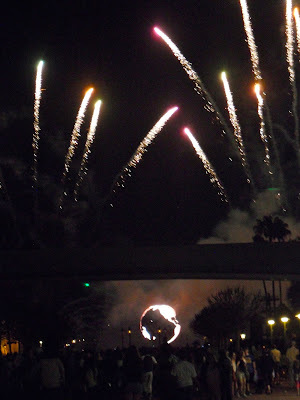 We don't always stop to see Illuminations but being in World Showcase when it is on is so magical. There is something in the air even if you are enjoying a drink or snack or stroll from pavilion to pavilion.